Northern Africa, particularly the Nile Valley and the Mediterranean Coast had long been visited by European merchants and travelers while, beyond the Sahara, the Niger River system had recently been explorer by the adventurers Mungo Park, Brown and others. Nonetheless speculation remained regarding he sources and course of the Niger, especially in the East, where a speculative river path leas south east from a proto-Lake Chad ( Wancara or Ungara) through a speculative mountain range, the Mountains of the Moon or the Mountains of Kong. Park, and others postulated the existence of the Mountains of Kong stretching across central Africa in an attempt to explain the Niger. Further north, caravan routes crisscross the Sahara. Southern Africa, a more pleasing climate to the Europeans, was in the meantime was actively and aggressively being colonized by the Dutch and the English. Here, the region is divided into various provinces including the recently acquired British Cape District and Zwellingdam, and the Dutch / Afrikaans Territories of Stellenbosch and Graaff Reyn. Numerous transcontinental routes are identified as are areas commendable to settlement, pasturage, and development. Of particular note is the route of John Campbell, an English Missionary through Zwellingdam. Campbell was commissioned to reconnaissance the area and provide a detailed report on the territory's country, settlements, and people. His report was highly regarded in its time and provided some of the best information about South Africa available in England. The whole is beautifully engraved in the minimalist English style pioneered in the early part of the 19th century. Thomson maps are known for their stunning color, awe inspiring size, and magnificent detail. Thomson's work, including this map, represents some of the finest cartographic art of the 19th century. Relief is shown by hachure with towns, cities, and major topographical features identified. Issued in 1815 as plate no. 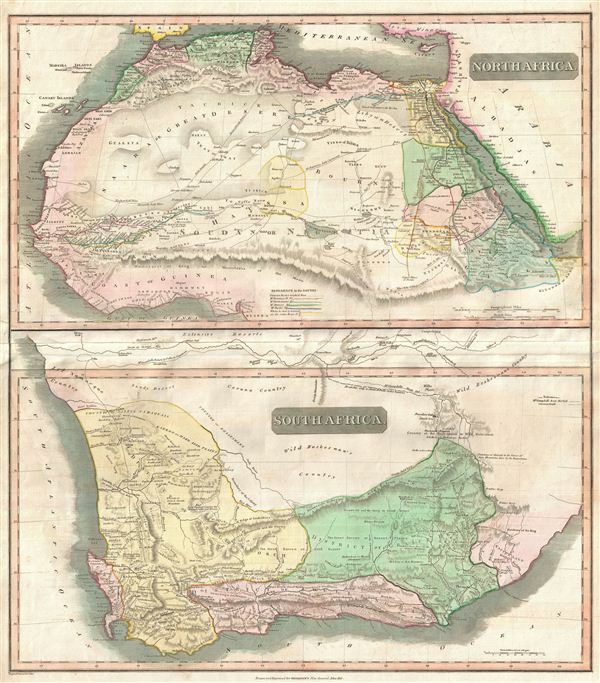 39 for Edinburgh cartographer John Thomson's 1817 New General Atlas. Rumsey 1007.054. Phillips (Atlases) 731. Newberry Library: Ayer 135 T4 1817.